Smart Docklands in partnership with Mastercard City Possible, Cities Today, Harvard TECH and hosted by Hibernia REIT, present an evening discussion and networking event on Future City innovation trends. 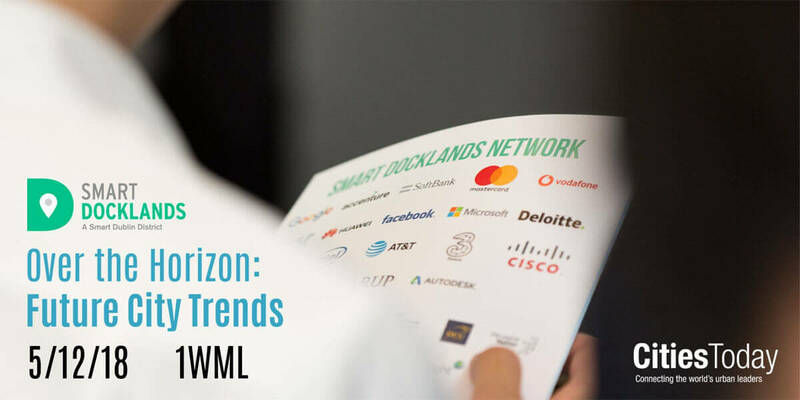 At 1 WML, we will be bringing together members of our Smart Docklands community to bring a close on a two day Cities Today 20-20 urban innovation leadership forum and also mark the end of a successful year for Smart Docklands (nominated for most innovative project idea at the Global Smart City Expo 2018). At the event we will be joined by leading city expert David Graham, Chair of San Diego Inclusive Connected Communities and Chief Innovation Officer for the California City of Carlsbad who will give a talk on future city innovation trends alongside the renowned David Ricketts –Innovation Fellow @ Harvard TECH and founder of the Harvard TECH global city innovation accelerator programme. Miguel Gamino, SVP of Cities for MasterCard and ex CTO for New York City will also introduce the recently launched Mastercard Global City Possible initiative of which Dublin City is a founding member.